Nesha leaves Dharamsala and his adoptive family. He is sad but confident in the adventures to come. The moon, the stars, the wind accompany him on the road of his new destiny. He walks all night, without glancing back. He has grown and he understands he can still discover new landscapes, new cities, and new friends. So Nesha relies on his lucky star, and also his friends, the moon, the stars and the wind. In the early morning, the sun smiles at him, the moon and the stars fade in the sky. The wind stays at the side and sings a melody. The mountains get smaller in the distance as the sun gets warmer. Nesha goes carefully towards the sea, and decides to approach Calcutta. Indeed, the Bengali Gulf is not far from the big city. This is how Nesha begin his long walk with his friends. Until the moment when he arrives to Delhi. The city is crowded with people. But what interest him are the children. He likes to play with them, to water on them with his trump. But Dehli children are different, they all go to school, and must help their parents! He doesn’t know where to go to find food, and he hurries finding a shelter. Yes, there, a big land with cows. 1 – Where is Nesha ? 2 – Where does he live at the beginning of his adventure? 3 - Where does he want to go? 4 – In which city does Nesha arrive? 5– With whom Nesha is speaking to find a shelter? Laminate them and cut each card. 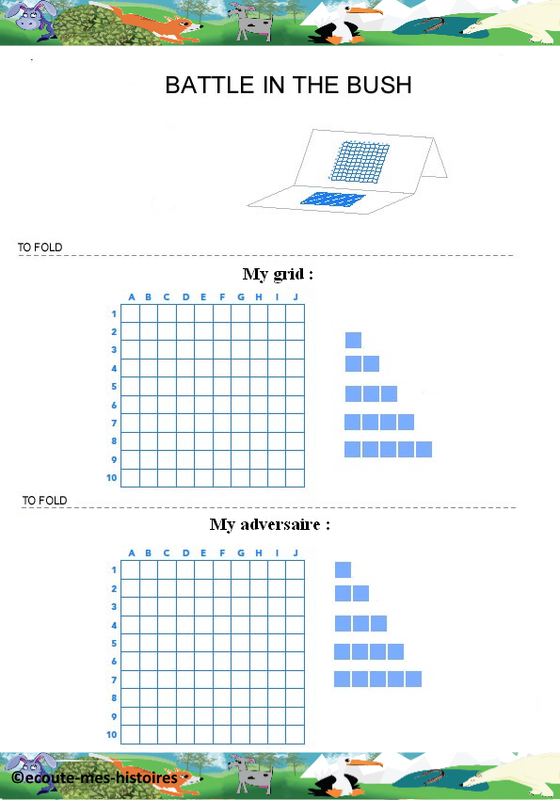 Play : Distribute 4 cards by players ; the remaning cards form the deck. Relaxation : We look Savanah, beauty of wildlife, nature, silence. - Good evening Nesha, What's up ? Ask him a black spotted cow. - Good evening, I am looking for a place to spend the night ; I come from far away, and I would like to rest befor I reach the ocean. - And why do you want to reach the Ocean ? - I like to visit and discover this beautiful country of India, but I learnt that there are other countries where the elephant live : I want to meet them and live with them. - That much ! I will live with all these animals ? Ask Nesha, all happy. - Yes, but be careful, these animals are wild. They are not used to live with humans, and they hunt to feed themselves, explain the cow. - But I am an elephant, I am strong, and I know how to defend myself, answer Nesha. - Then, I will take you there, as it is your wish, but I advise you. Be really careful, and have a nice stay in Africa. And Nesha, amazed, discover a different country, called the Bush. 1 - In wich country does Nesha want to go ? 2 – What does the cow say to him ? 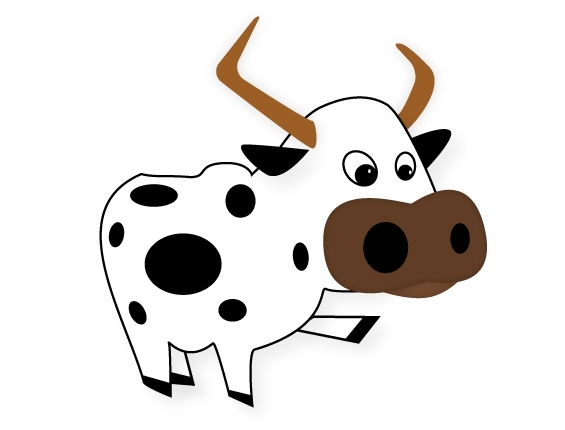 3 – What does Nesha experience with the cow? 4 – Where does Nesha arrive? - Hey, a new guy! We never saw you before. Where were you? Ask the group of elephants who try to understand what is happening. - Hi, I am Nesha, and I come from my country: India. - We live happily with humans in India. They like our company and they celebrate us, in the honor of Ganesh each year. Explains Nesha. - Really! And who is this Ganesh so important in India? Then Nesha recalls the beautiful story he was told by the turtle, two years ago already. - You look like God Ganesh. Also, one of his very many qualities is wisdom, and this is my wish to you for your birthday. 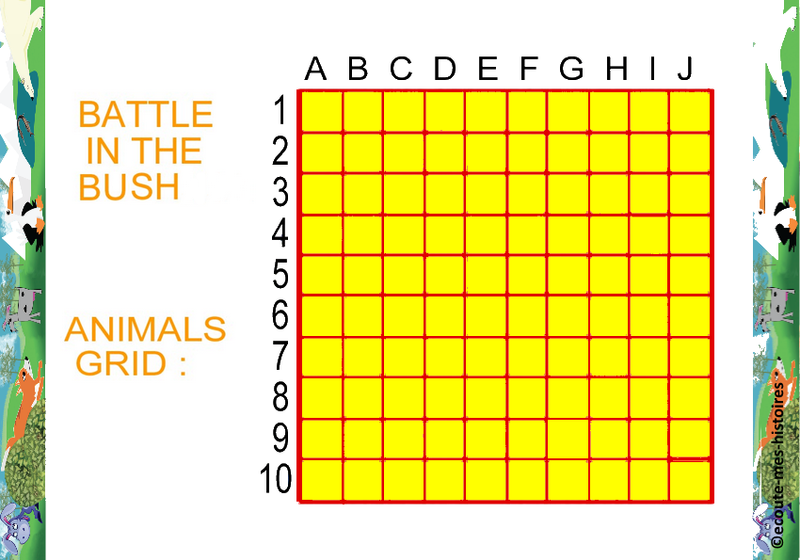 1 – Which animals does Nesha meet? 2 – Which story does Nesha tell? 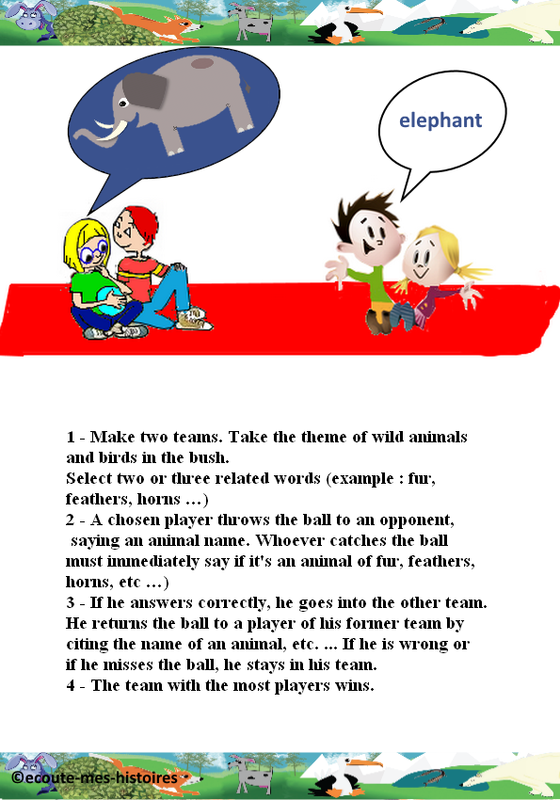 3 – What is the main quality of Elephants? - Well, here in Africa, it is not the same thing. On the contrary, many men hunt us and steal our ivory tusks, because, to them, it represents a lot of money. And every day we need to protect ourselves to not get massacred, explain the elephant's leader. - Yet we are nice, how can humans massacre you? They blame us for their plantations' damages. But they are the first one to destroy the places where we find our food. They come to run coffee and cacao exploitation, even in our protected zones. Yet we need to go and feed somewhere else, and this is why we devastate, at our great regret, banana fields, and other fruits' fields. Explains Nesha's cousins. - In fact, by our behaviour and our feed, we contribute to the conservation of bio diversity and also the very regeneration of the ecosystem where we all live (as scientists would say). We feed with fruits and we move everyday of 6 kms. Thanks to that, we scatter the seeds of various plants. That way, weeven ease the germination some seeds'species that we put down on our way. Humans should protect us and not destroy us! Nesha listens to his cousins'complaint. - I would never have imagined how difficult it is for you to live in this country called Africa. 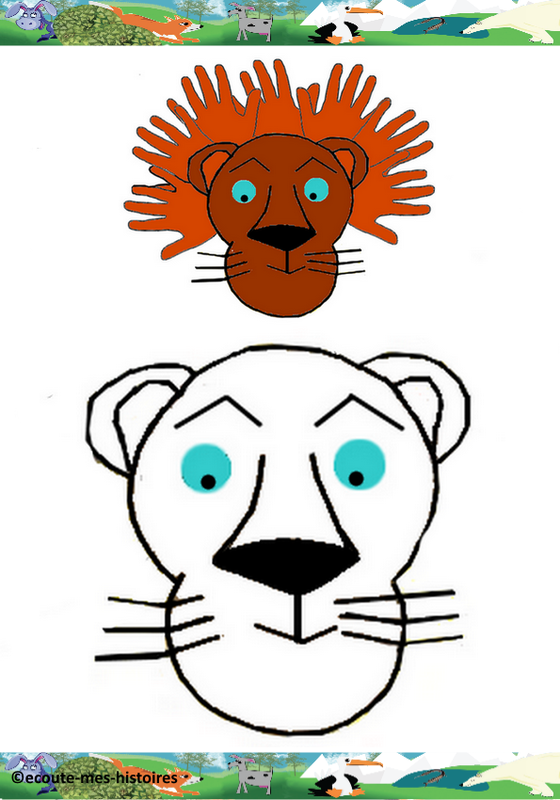 Is it the same for the other animals? Asks Nesha. Unfortunately yes, answers a giraffe, it is the same for us, for the hippos, the lions, the leopards, the lemurs..., well for all of us who want to live on our territory, quietly! In the forest, let's meet. 1 - What happens to Elephants in Africa? 2 – Who hunts the Elephants? Why? 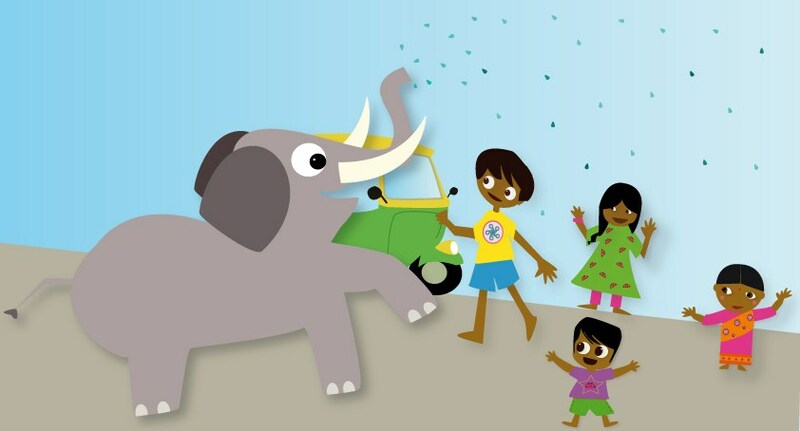 3 – Are the Elephants well protected? We continue the coloring, cutting and assemblies of fresco. If we want, we can varnished it. - Well! You are really tall! And you are? Asks Nesha to the Giraffe. - A giraffe. Yes, our neck is long, and this is what allows us to eat the leaves at the top of the trees, really high. - I am a male; but I am joining my herd soon. We are not very far away, because here there are a lot of big trees, mostly acacias, and we can easily feed. -And you too giraffes are being hunted? Innocently asks Nesha. -Yes, humans hunt us for our meat and our skin. We also get killed for our tail, used as a symbol of authority. They also destroy our habitat. This is why we are in this protected zone, but we still need to be careful with humans (poachers), lions and crocodiles. And there are a lot around here, explains the giraffe. -I would like to meet your group. - With pleasure. You will see, we train our calves to race, because it is important for them to protect from humans, and lions sometimes. Do you know that we can run up to 34 miles per hour (55Km/hour)? Asks the giraffe. And this is how Nesha goes to meet his new friends: the giraffes. They are waiting for him: they already know that a new elephant has arrived in the savannah. They are also curious and question Nesha on his life in India. But Nesha is very impressed by their highness, and the softness of their look. He likes them already, and feels good close to them. 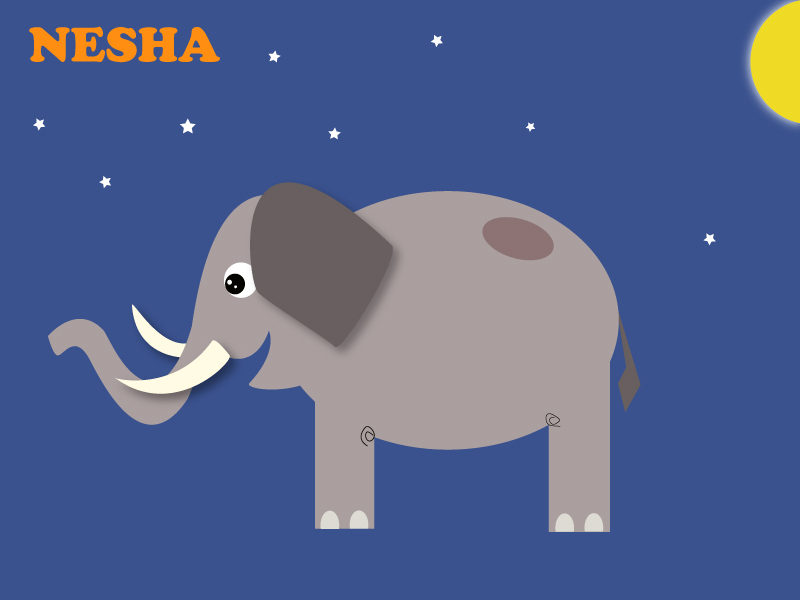 1 – Which animal does Nesha get to know? 2 – Who hunts the Giraffes and why? 3 – What is the highest speed a giraffe can run? Help mom find her little panther which walked away from her and got lost. This is how tonight, during the sunset, they explain to him that they are not going to sleep a lot. - We only sleep 2 hours a night, and we drowse by day but keeping our big eyes open, no more than 3 minutes, to watch the horizon. - You keep watch on the poachers? Asks Nesha. - Yes, and thanks to our long neck, we can see them. Our calves are weak, our parents too, and they are the main prey of these poachers. And the hyenas, leopards, and crocodiles often kill our calves. - This is why we rest and sleep standing up, explains the head of the herd. - Standing up? All the time? Says Nesha. - If we feel perfectly safe, we sleep and rest on the ground. As we are tall, we need a lot of time to stand up, which makes us vulnerables when we are hunted. - Can I spend the night with you? Asks Nesha. - With great pleasure. Rest well, and we will see you in the morning. Good night Nesha. 1 – Do Giraffes sleep a lot? 2 – How do they sleep most of the time? 3 – Who hunt Giraffes? This morning, when he wakes up, Nesha feels a small presence. It's a lemur. He goes away from his group and ask asylum to the giraffes. - Hello marmoset, careful that, I don't smash you with my big feet, says Nesha. - Oh! Sorry. You look like a monkey. - Not only I am not a monkey, but I don't even begin to their family. You compare me to them, but learn that I belong to a different species. - Very well, understood! What is your name? - My name is Nesha; I come from India, the country where I was born. You are not scared to leave your family? You may get killed by poachers. - Yes, but it is stronger than me, I always want to have fun, meet some friends, and I have a lot of giraffes calves friends, says Chico. Anyway, we get hunted all the time as well, and we don't have a lot of places where we can leave neither. - If I understand this well, you may disappear? Asks Nesha. - Yes, and if men don't change, we may entirely disappear. We were lots of species before. Why do we get killed? Asks Chico. - You are sold for your meat or as pets, explains the chief of the giraffes. - Pets, why not, but eating our meat is cruel, says Chico, all sad. - All of this is sad, states Nesha. But, however, why don't we party all together? Chico, go and get your family, and we are going to meet my cousins elephants, and all together we are going to have fun. - What a good idea. Where shall we meet? Asks Chico. - Near the lake? There is a big space, were we will be able to all have fun, and rest afterwards, suggests the chief of the giraffes. And this is how all our friends gather in a good mood. 1 – Is Chico a monkey? 2 – Why are lemurs being hunted? The Hippos arrive near the lake and bathe happily. - Hey, friends! Would anyone like to join us? We want to make a party to celebrate my arrival in your country, in the Bush. Says Nesha with a smile. And so begins the screeching, the trumpeting, screaming Lemurs, some bawling Giraffes and bellowlng Hippos. The party is in full swing and then a herd of Impalas arrive, surprised by the atmosphere, they ask to join the group, and they too begin to roar with delight. They sing and dance with pleasure to be together all night until the early hours of the morning, Nesha and his friends rest, even the giraffes too ! Lady Moon winks at Nesha; there is a light breeze in the air to refresh the new day ahead. All is calm, the Bush awakens while all his friends sleep. Nesha cannot believe that in this place so beautiful, as this, the animals are threatened, are afraid of men who want to kill them to make money. He thinks of his new family that he loves so much. Who is playing in water ? What is flock arrives at the lake? It is the Impalas who were the first to sound the alarm. Immediately, the lemurs call for help. The Giraffes understand what is happening, get up awkardly and The Elephants follow. The Hippos leave the water and reach the whole tribe, anxious and afraid. Nesha! Wake up! The situation is serious. Quick!, We must leave here! Yesterday our party alarmed the poachers, they heard us and are ready to kill us. Says the Head of The Tribe of Elephants. But we are many, Why fear? We are stronger and more powerful than men. We do not flee! On the contrary, we must put ourselves in a position of attack. Says Nesha proudly. But they have weapons, and it's easy for them to kill us. The older animals can accompany the females with their young. We younger ones, we will organize and fight the poachers. These faulse Hunters! suggests Nesha. We, The Hippos, we will form a circle and when we see a hunter, together we will hunt them all. What do you think all? Leave us alone !ordered the head of Giraffes. You have no bussiness here! Yes, replied the Head of the Elephants. We have to organize and position ourselves to surprise them. They're watching us, ready to throw their spears, to use their guns, but if we remain grouped, we can fight back and drive them from our home. And for the first time, The Hippos, Elephants, Giraffes, Impalas come together to defend themselves from the poachers. This is a great victory! 1 – Which gives the alarm first ? 2 – Why the alarm ? What's going on ? 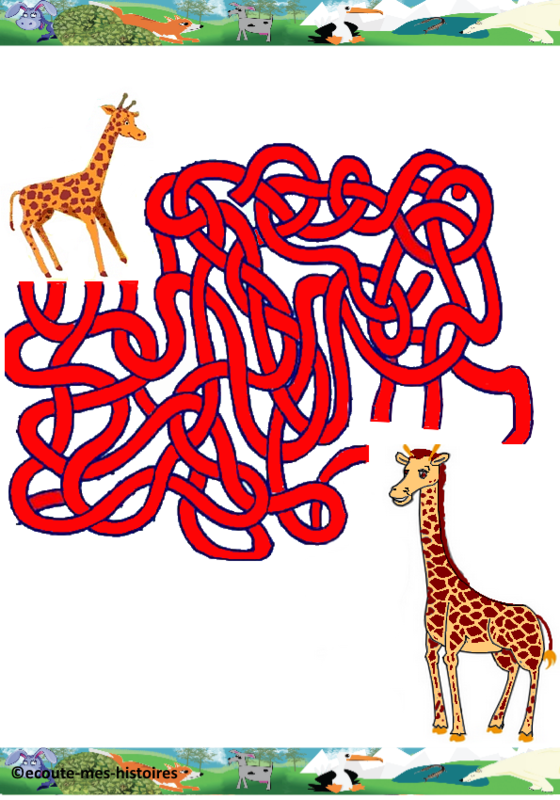 3 – What does Nesha to the Giraffes ? 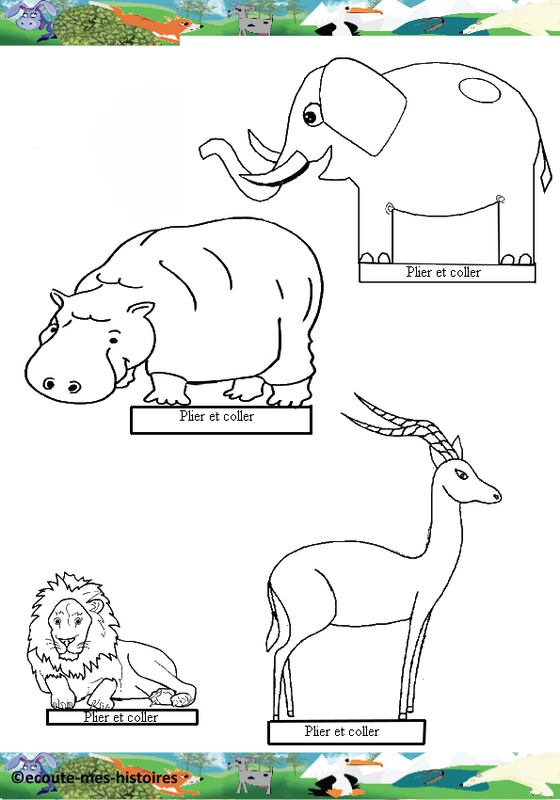 4 – What does the Impalas, the Hippos, the Elephants to defend themselves ? Chico, playful, stay to listen to the battle strategy of his friends. He has an idea he wants to share it, even if it has to be rebuffed. - What are you still doing here? You wanna get slaughtered? Tells the head of giraffes. - I just wanna tell you, I have an idea, maybe I can submit? Says Chico timidly. - Good fast, hurry up, we are listening you. - Here! I have friends in the Bush that can help us. They are humans, but they are very nice to us, and they treat us when we are injured, they feed us and protect us. If we asked their help? Chico offers. - You know them well? We can trust them? Request Nesha. - Yes, it's a Bush hospital. They collect all the injured animals, their caregivers, and there are everyday some children who learn in this school. They love us very much and they are taught how to respect us, how we let them live freely on our land. Moreover, we are in an area protected by them. - Ah yes! Protected! You speak! And poachers, so why are they there? Not to bring us food! Say the Hippopotamus. - Normally, poaching is prohibited, but humans have always struggled to enforce the laws, nature. Fortunately, there are some who defend us! Chico says. - And how to prevent? They are away? - I hurry, I alert, and we come back as soon as possible. Chico offers. It will take approximately 1 hour. - 1 hour? It's long! It should anyway get in position to attack, say the Hippos. 1 - What does Chico? 2 - What are the friends whom he speaks? 3 - Why the laws are not respected? Poachers are posted behind the bushes. Friends of the Nesha feel. But we must also surprise them from behind. Then, the Hippos are positioning themselves vanguard, while elephants bypass the location of Guards! Poachers. The Giraffes guide them, and impalas are in front to protect them with their horns. - There are five poachers, say the Giraffes. They have spears, so watch out for you! - We are 10 Hippos, one should be able to attack them head on. Expect them to show themselves. - We, meanwhile, we are preparing to encircle them if they attack, say the elephants. Then begin the wait. Who will attack? Poachers? Hippos? It's been 30 minutes that everyone is on guards. The time seems long, and the slightest sound suspicious. No new friends from Chico. It's getting hot, but no way to bathe. Finally, shouts. Yes, the cries of Chico! He warns his friends. - We arrive, hang in there. How together to scare poachers. It's going to scare them away. Indeed, the poachers understand that they are unmasked. Hippos charge, just to show their strength, and hear the cries of Chico with his friends. 1 - What are doing the Hippos? 2 - What are doing the Elephants? 3 - Who Chico returns it to catch the poachers? 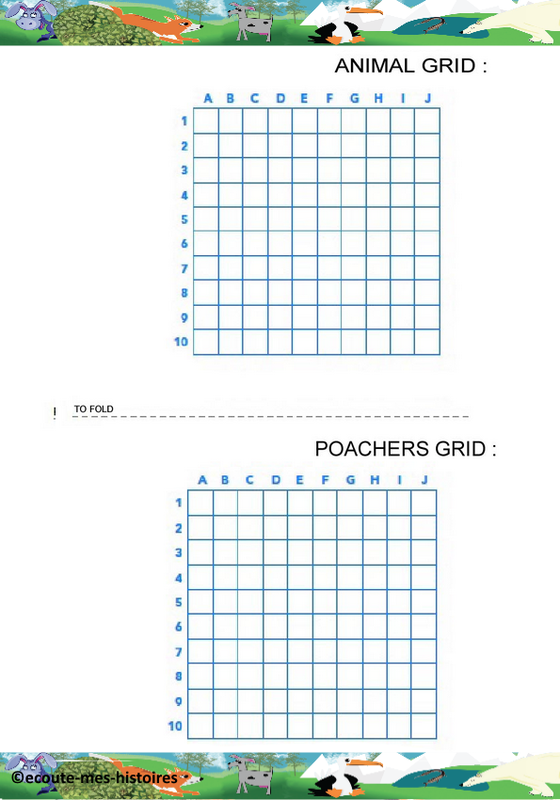 4 - What will happen to poachers? Goal of the game: players must find as many words as possible that begin with chosen letter. If they do not find it, they can invent a story. 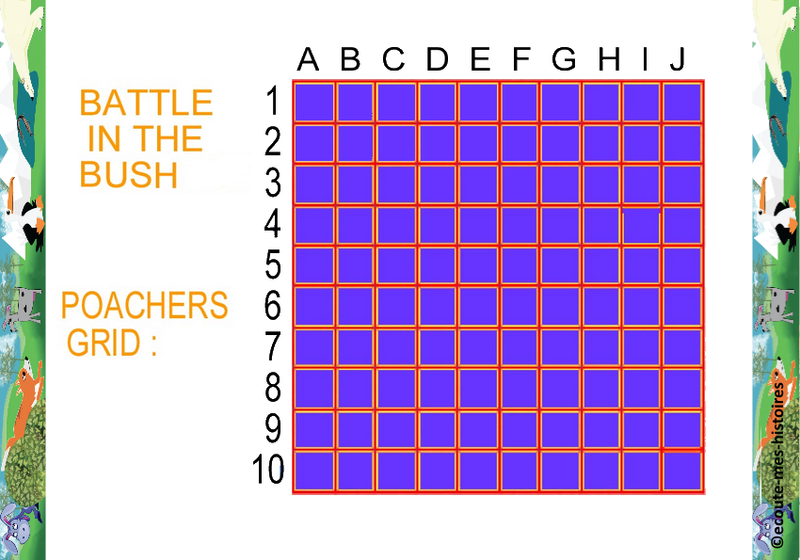 1 - A letter is chosen at random. 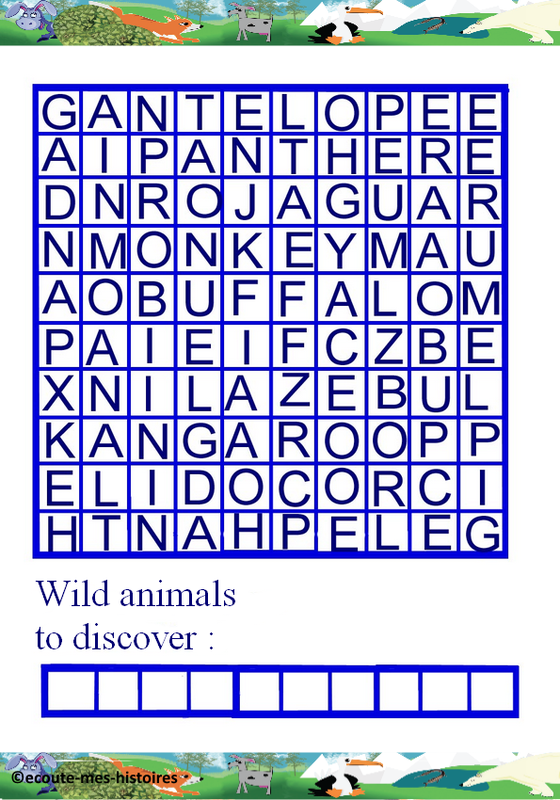 3 - The winner is the one who found the most animals. He can extend his list and make a sentence full of imagination if desired. Panicked, the poachers want to flee. Chico is surrounded by all his friends, armed with drums, horns. They immediately begin to run after the poachers, to catch them, and take them to stand trial. Then, Nesha and all his friends are happy. - We can be stronger than men, even without any weapons. Congratulations Chico! Thanks you all. The Rhinos are proud of Chico and all his friends, and The Lions are curious to have news of them. - Beware of The Lions, The Deers scream. They will hunt us too! - What do you want? We are strong enough to stop you from hunting us tonight. Go! Leave us alone! We are having a party and stop disturbing us! - Yes tonight, we come as friends, and we leave you to have fun. But we also want to join your group and introduce our new little cub. Is it okay? We are so excited about this birth, it's important to us, and for this beautiful National Park. So tonight, it will be a great show: all animals from all over the Savannah are present: Zebras, Eagles, Porcupines, Hedgehogs, Snakes, Toucans and even Owls, Ostriches, Flamingos. The Deers are shy to venture into the group and are happy to watch this unique show. It was decided this special night not to hunt but to have fun. Everyone has a chance to show their talent. The Zebras and Gazelles dance, Foxes and Turtles are racing, Porcupines and Hedgehogs curl up and have fun provoking each other, The Pink Flamingos make jokes with the Ostriches. Nesha will never forget this special evening. The Snakes are surprised by all the groupes of different animals gathered together this special night. Nesha is watching just in case….... He knows them very well! The dawn breaks and the day begins. That's when The Lions roar. Before leaving, they present their cubs to the community, and tell those who wish to know the life they have inherited is sacred. And at this unique time, in harmony and unison they will sing a hymn of praise to life. Who is the cry of The Elephant? Who is the cry of The Giraffe? Who is the cry of The Lemur?